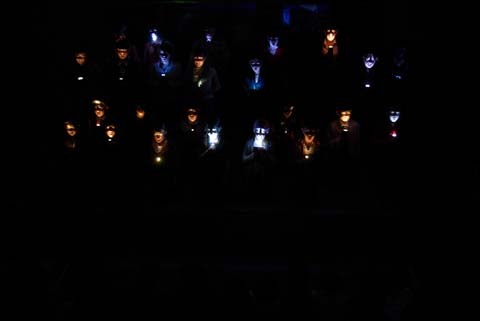 On June 24th, St John’s Day, 2010, the world premiere of The Spooky Feast in the Scary Field, was performed by a very large cast at 7pm in Johnswell Hall, Johnswell, Co Kilkenny to a very large audience who responded to the production with much applause and curiosity. This was a remarkable event not merely because it had been many years since any play had been performed in Johnswell but especially because the actors in this performance piece ranged in age from five to twelve years old AND these same marvels had devised or co-written the pieces in which they starred. Those who had previously made their stage debuts with other theatrical companies proved able mentors to those who were stepping out on the boards for the very first time. Perhaps what made it most special was the collaborative engagement between all involved which was so rich and fruitful. The response to the performance has been to further excite the interest of the community in the collaborative possibilities of the project. The Spooky Feast in the Scary Field arose out of a serendipitous conversation with the Outreach Officer of Barnstorm Theatre Company, Anna Galligan. 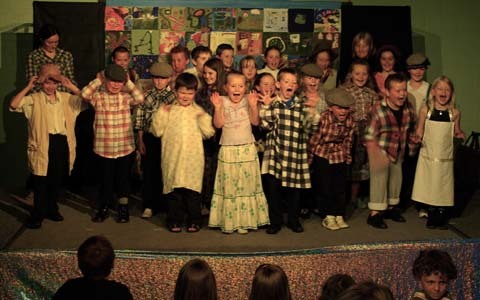 Realising that theatre might offer great possibilities for the engagement of the young with the Townlands Project I had in mind the possible development of a performance by local children based on folklore and fieldnames. 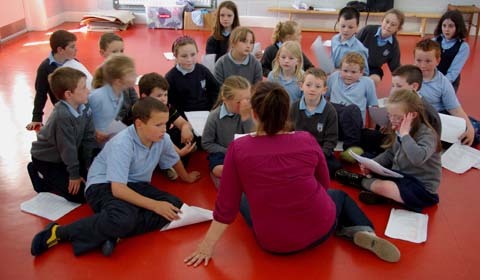 Anna responded to the possibility with enthusiasm and we were most fortunate to receive the support of an Arts Act Grant from Kilkenny County Council which allowed Barnstorm to work with the pupils and staff of Johnswell National School and in the process to devise and develop their own production. Between 1936 and 1938 the Irish Folklore Commission, or Béaloideas, enlisted the teachers of every national school in the country to encourage their pupils to act as researchers of local history,place name and folklore within their own homes and communities. 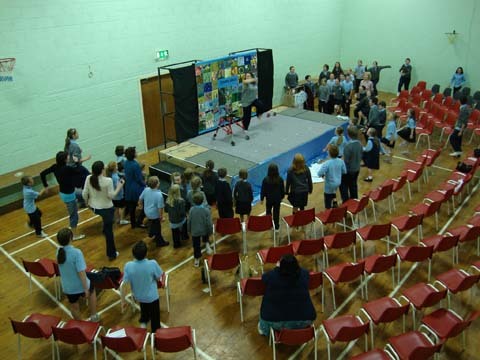 Together,the Townlands Project, Barnstorm and today’s school staff decided to develop a performance based on material gathered by pupils of Johnswell School over seventy years previously. This bridge between the generations made the devising process especially rich and for older members of the community made the performance especially poignant. Given the tight parameters within which the process had to be realised and the limitations of the budget Anna brought about something almost miraculous. Her skills of encouragement and engagement with the young are remarkable. However she could not have achieved what she did without the wonderful patience and enthusiasm of school principal Anne Holohan and her dedicated staff. The minds of the young of Johnswell are in good and caring hands. The Spooky Feast in the Scary Field! Many of these children will one day be the guardians of this landscape. If we can enrich their sense of place by helping them to explore what makes their home place unique while encouraging them to be active in its celebration it will have been work well done. If the fires of curiosity are lit in the minds of the young, that light might be passed on to the next generation in turn.